Last night, Sidney and I happily performed our civic duty and voted in the 2018 midterm election. We went to the very spot we cast our ballots in the historic 2016 Presidential Election, Ocean Bay Elementary School. However, it was a much different scene this time around. Instead of a massive line that snaked around the entire cafeteria and out the door, the room was practically empty. With the exception of one other voter, we were alone with the polling volunteers. After having our I.D. cards checked, we went right up to our respective machines and did our duty. Sidney and I voted in the 2018 Midterm Election at Ocean Bay Elementary. I was a little surprised. Although I didn’t expect the madhouse that we encountered in 2016, I thought that because we went right after work (a peak time) and because of the importance of the election that we would walk right into a crowd. Not that I was disappointed. Spending just five minutes when you thought you would spend at least 50 is a win in my book. Speaking of wins, which party ended up as the big victor? From my vantage point it is tough to tell. One thing that we can all probably agree to is that the “Big Blue Wave” that was supposed to sweep the country never quite materialized (didn’t we learn anything from 2016?). Although history and other signs pointed to the Democrats easily regaining the house this election period, I am sure a lot of folks in the party are still relieved that it played out that way. As for the Repbulicans, the party exceeded expectations with big wins in the Senate. The GOP seemed to secure important victories in the high profile races all night long. Losing the House will undoubtedly hurt, but I bet members of the party are pleasently pleased at how everything unfolded, especially considering that there was talk earlier in the game that they might lose the Senate as well. So, it is tough for me to really say the Democrats or Republicans had the better night. I think it is fair to say that the Democrats probably hoped for more while the Republicans performed a little better than expected. Still, I am not drawing a line in the sand to say that either party scored an overall victory over the other. Although I can’t declare either party a winner, I think it is rather easy to recognize some groups and people who did very well. Women candidates did an exceptional job, taking over numerous seats and offering inspiration to those younger females who have aspirations of one day running for office. I welcome a more proportianate balance of power when it comes to gender. Minorities also had a strong showing as those of non-Christian religious backgrounds won races. In Colorado, voters elected the first openly gay governor. As for individuals, I think President Trump once again comes out on top over those who love to hate him. Not only did most of the candidates he supported end up winning, but he avoided the major midterm disaster that most first term presidents are subject to. In all honesty, he didn’t just “avoid” it, he completely rebuffed it. Additionally, most political analysts conceded that his strategy of focusing on immigration ended up paying off. Judging by all the “I Voted” sticker selfies on Facebook, I want to commend everyone for voting. What an intense, passionate midterm election cycle this was. I think my readers from both parties can walk out of this one feeling satisfied in different ways. Don’t Blink. 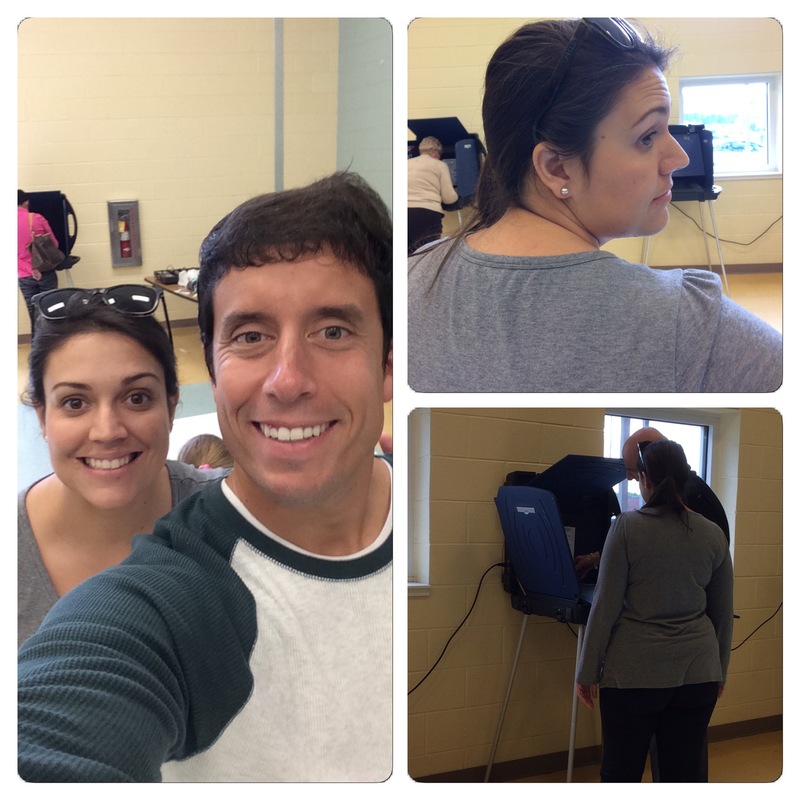 Today it was the pleasure of Sidney and I to perform our civic duties and vote. 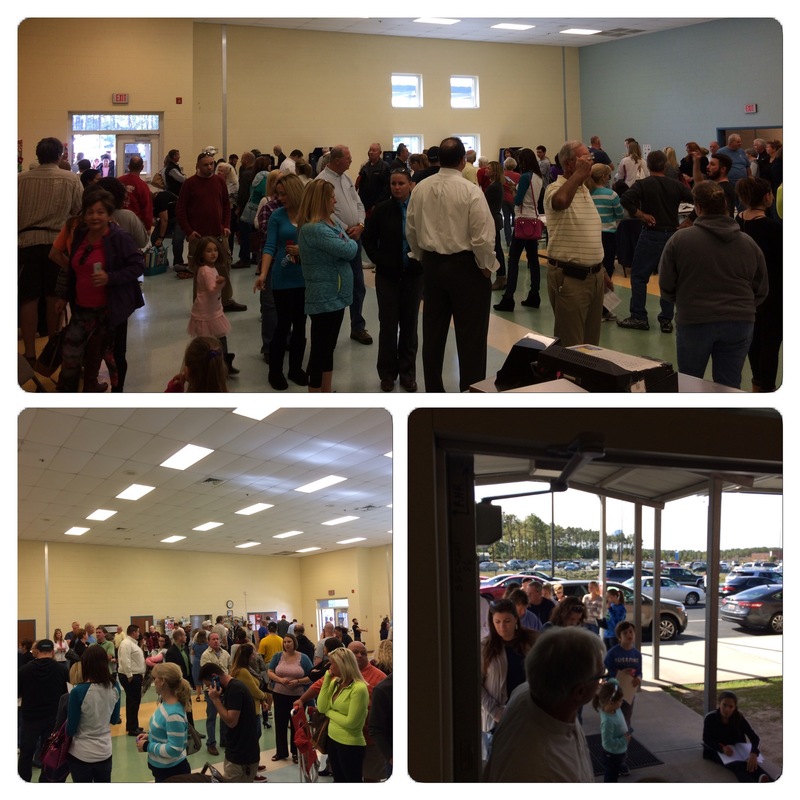 We went to Ocean Bay Elementary School in Myrtle Beach to cast our ballots. 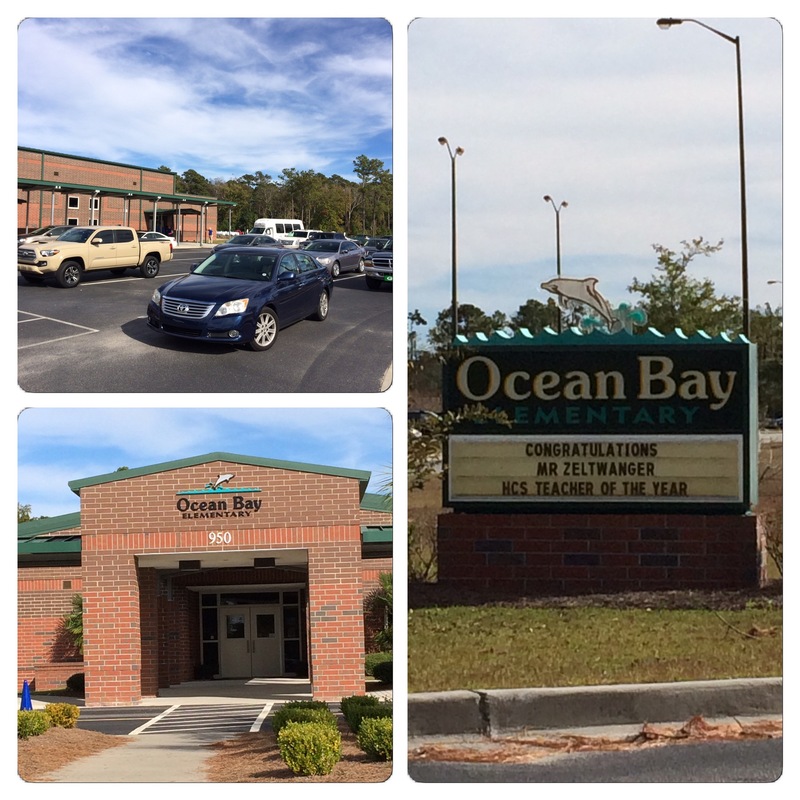 We voted at Ocean Bay Elementary in Myrtle Beach today. We quickly learned we weren’t just poking our heads in to vote. With the line stretching outside the school, it made for a long afternoon. Inside, the line stretched and curved all around the school’s cafeteria. The turnout at our voting precinct was heavy. The line snaked around the entire cafeteria and out the door. We passed the time in line by talking to our neighbors in front of us and in back of us. As South Carolina is very much a red state, I overheard a lot of people voicing their support for Trump. One man said he would “wait all day to vote for Trump” while another commented that he didn’t care about the rest of the ballot, he just wanted to vote for Donald. 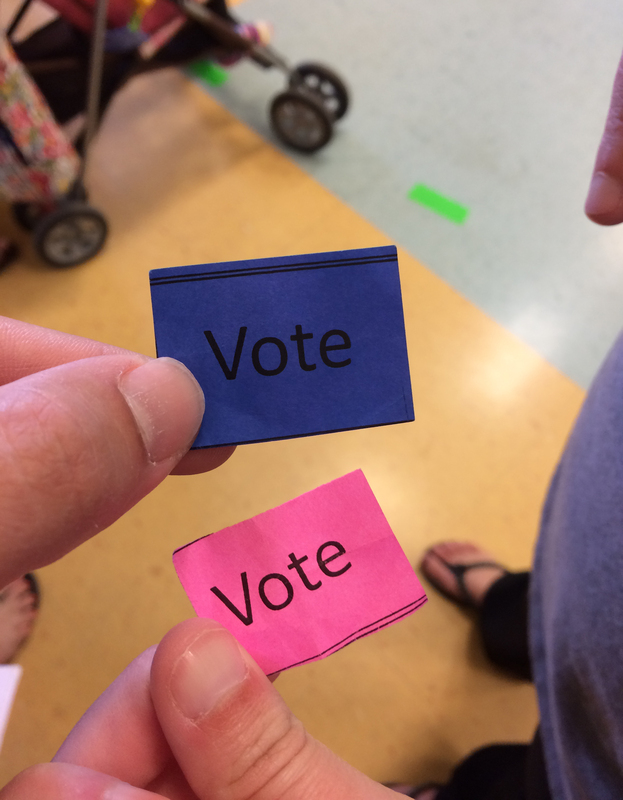 After we checked in at the voting precinct, we were given these little “vote” cards that we eventually would give to the voting official at the front of the line. After two hours and 20 minutes in line, Sidney and I finally reached the front of it. A main reason for the long wait wasn’t just because of the strong turnout, it was also because out of the seven voting machines installed, only three were in working order. After two hours and 20 minutes, we finally reached the front of the line. 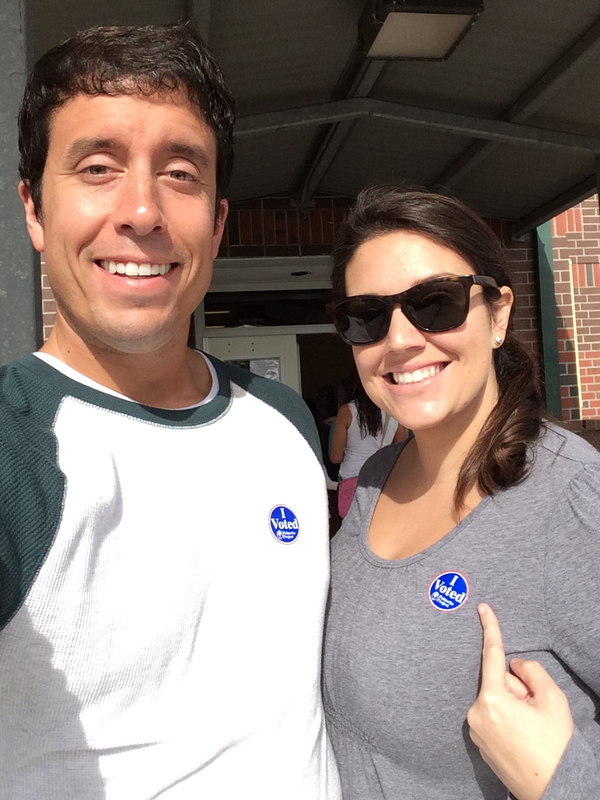 Once we submitted our ballots we received our coveted stickers and took the obligatory “we voted” selfie. Then, hungry from the long wait in line, we went off to lunch. 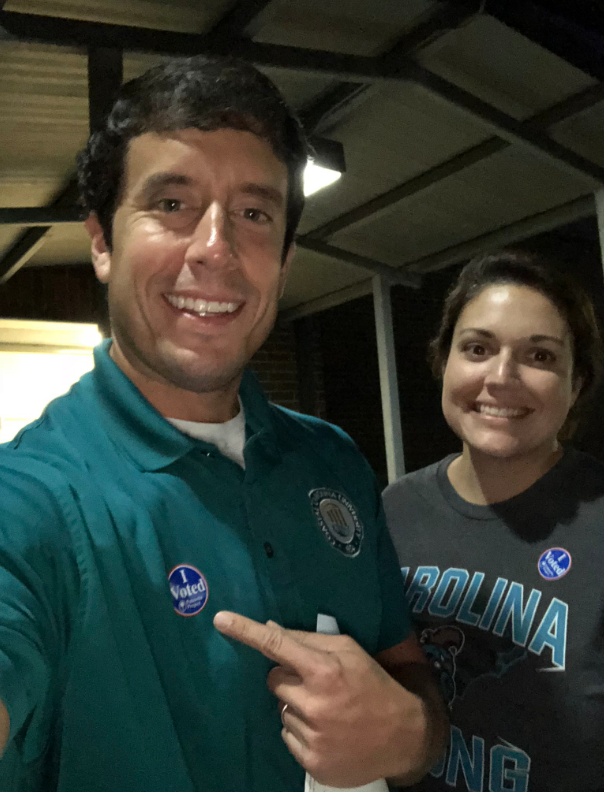 Wearing the stickers to prove it, Sidney and I posed for this selfie outside of Ocean Bay Elementary after casting our ballots. My story, along with the millions of other voting experiences shared by others today, is a major example of why the United States of America is the best country on the planet. To have the opportunity to voice our opinion for the top leader in the nation along with our preference on many other races and issues is an extraordinary right that we all need to appreciate and take advantage of. I voted and I am proud of that. Don’t Blink.